Different types of material used in the pile foundation are cement, steel, timber and plastic which are a slender, structural member installed in the ground to transfer the structural loads to soils at some significant depth below the base of the structure. 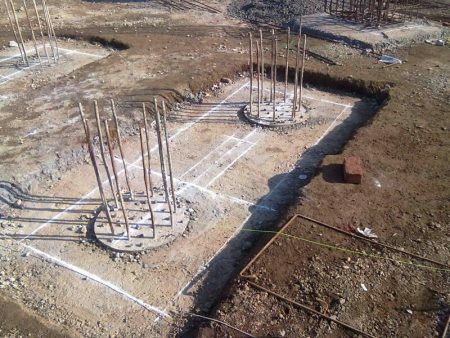 In this article we briefly study about the materials used in the construction of pile foundation, its advantage and disadvantages. 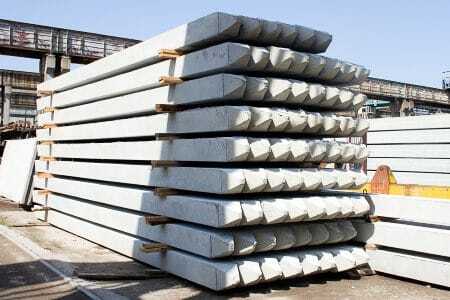 Precast concrete piles are constructed in high-quality controlled concrete and reinforced. There are available in different shapes such as square, triangle, circle or octagonal section. The standard available size is of 1m height, they can be connected and any length can be obtained with out compromising the design load capacity. Reinforcement is necessary within the pile to help withstand both handling and driving stresses. Stable in squeezing ground, for example, soft clay, silts and peat pile material can be inspected before piling. Are easy to splice. Relatively inexpensive. Can be driven in long lengths. Can increase the relative density of a granular founding stratum. Displacement, heave, and disturbance of the soil during driving. Can be damaged during driving. Replacement piles may be required. Cannot be driven with very large diameters or in condition of limited headroom. Cast in place concrete piles are the most type commonly used for foundations due to the great diversity available for pouring concrete and the introduction of the pile into the soil. 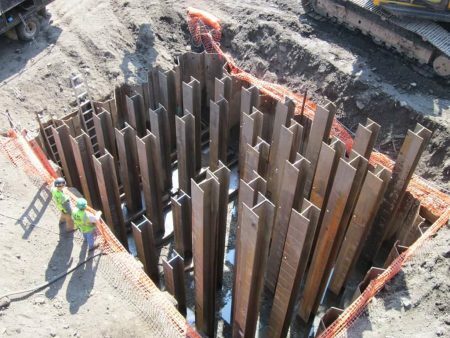 Driving and drilling piles are two types of cast in place concrete piles. Can be inspected before casting can easily be cut or extended to the desired length. The piles can be cast before excavation. Pile lengths are readily adjustable. An enlarged base can be formed which can increase the relative density of a granular founding stratum leading to much higher end bearing capacity. Reinforcement is not determined by the effects of handling or driving stresses. Heave of neighbouring ground surface, which could lead to re consolidation and the development of negative skin friction forces on piles..
Tensile damage to unreinforced piles or piles consisting of green concrete, where forces at the toe have been sufficient to resist upward movements. Damage piles consisting of uncased or thinly cased green concrete due to the lateral forces set up in the soil. Concrete may be weakened if artesian flow pipes up shaft of piles when tube is withdrawn. Light steel section or pre-cast concrete shells may be damaged or distorted by hard driving. Cannot be driven where headroom is limited. Time consuming; cannot be used immediately after the installation. Steel piles are made of high quality steel and the section is in the form of H, X or of thick pipes. They are suitable for handling and driving in long lengths. Their relatively small cross-sectional area combined with their high strength makes penetration easier in firm soil. They can be easily cut off or joined by welding. If the pile is driven into a soil with low pH value, then there is a risk of corrosion. Although tar coating or cathodic protection can be employed in permanent works to avoid corrosion. Fig 4: Different shapes of steel piles. The piles are easy to handle and can easily be cut to desired length. Can be driven through dense layers. The lateral displacement of the soil during driving is low (steel section H or I section piles) can be relatively easily spliced or bolted. Can be driven hard and in very long lengths. Will deviate relatively easy during driving. Timber piles were used in old days. Now a days due to scarcity of timber wood, the use of this in pile foundation is reduced drastically. Timber is most suitable for long cohesion piling and piling beneath embankments. The timber should be in a good condition and should not have been attacked by insects. 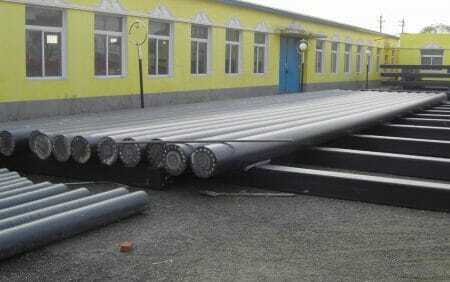 For timber piles of length less than 14 meters, the diameter of the tip should be greater than 150 mm. If the length is greater than 18 meters a tip with a diameter of 125 mm is acceptable. It is essential that the timber is driven in the right direction and should not be driven into firm ground, as this can easily damage the pile. Keeping the timber below the groundwater level will protect the timber against decay and putrefaction. 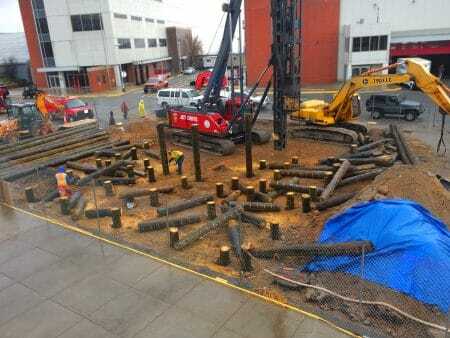 To protect and strengthen the tip of the pile, timber piles can be provided with toe cover. Relatively inexpensive where timber is plentiful. Sections can be joined together and excess length easily removed. The piles will rot above the ground water level. Have a limited bearing capacity. Can easily be damaged during driving by stones and boulders. The piles are difficult to splice and are attacked by marine borers in salt water. Plastic piles comprise a variety of composite materials that include polymer composites, PVC, and recycled materials. These piles are used in special applications such as in marine environments and within soil zones exposed to seasonal changes.